Hey lovelies - what's poppin'? I know it has been a minute since I've posted but I've come to realize that periodical breaks from the blog and social media are good for my soul. I have successfully settled into Edmonton and am slowly finding my footing in this new city. I won't lie, it is a far cry from the hustle and bustle of Toronto (I am completely a big city girl) but I am excited to find all the hidden gems this city has to offer. As for the work front, I am very slowly getting used to shift work, but damn - this shift work life is extremely real. The first battle was getting myself to make it through 12 hour day shifts (still working on that) followed by getting through 12 hour night shifts (not even close). But it's all good - I am staying positive and am surrounded by a group of positive colleagues that are teaching me the ropes (cries internally). I applaud all the doctors, EMTs, nurses, researchers, mothers etc. who live this shift work life - please teach me your ways y'all! I think under the stress of moving and starting a new job in a city where I am completely alone, I lost a bit of my sauce. I feel like the technical, logic based half of my brain kicked into overdrive, stunting my creative, emotionally driven side that I cherish so much. I have had to use my technical brain to learn the new job and deal logically with figuring out my life in general; however, I have been hearing my creative side yelling in the background, asking to be freed. On top of this, I have felt a drastic separation from the body positive movement recently. I won't go into too much detail on that in this post as I am still working through my own thoughts on all this, but I believe the momevement has begun to alienate it's base. 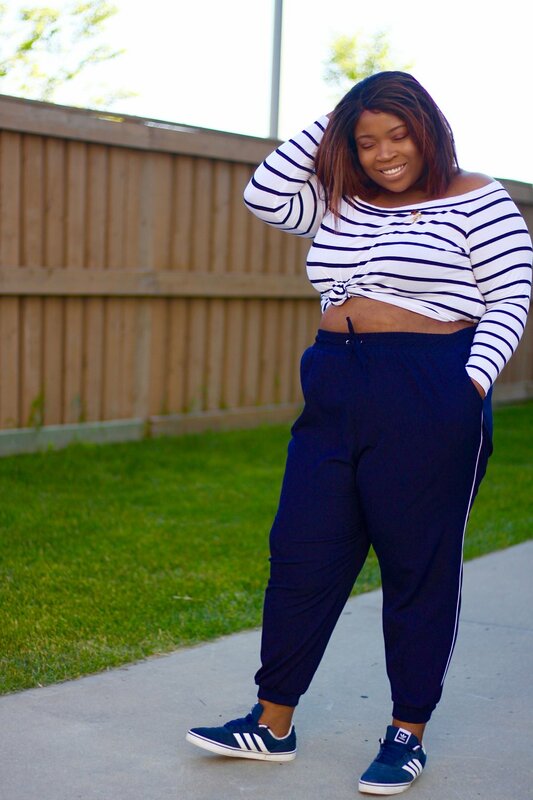 I feel like I see the same types of plus size bodies being glorified, models who made their names on the backs of plus women (cough - Ashley Graham - cough) turning around and discrediting the struggle of being fat in today's society based on their pseudo celeb status and the over glorification of bloggers and influencers who preach body positivity but turn around and bash a female's body for a few likes and a handful of retweets (wow - I got caught up in my feelings with that roundabout sentence but I hope you caught my flow). All-in-all, I had to step back and re-evaluate why I blog and find ways to be more open and connect with all of you, my readers and friends. So here I am! Back again - batteries charged to 100%, drinking 2L of water daily and being the best me I can be. I thank everyone who has hung around during my hiatus (I appreciate y'all more than I can even put into words) and I look forward to sharing more about me personally than I have before.